How to make Foil Covered Easter Eggs! 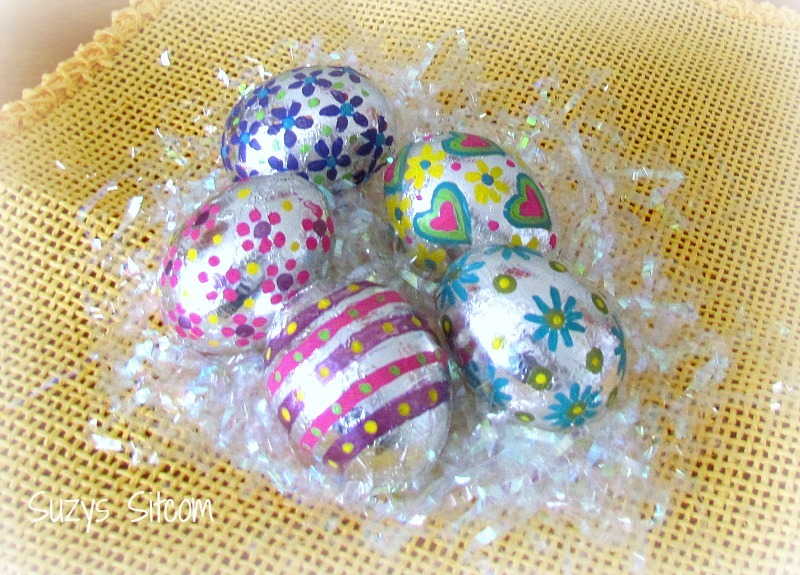 With Easter is just around the corner, I thought I’d bring you a fun Easter craft that costs nearly nothing to make and is fun and easy to do! 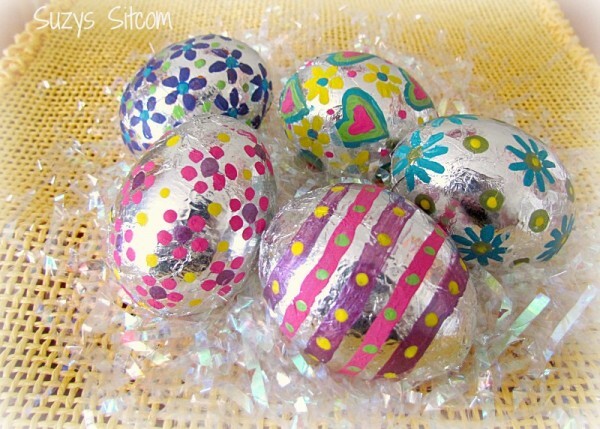 How about foil covered Easter eggs? Pretty! I’m a big fan of metallics, and when I discovered the art of burnishing foil onto things, it came to mind that this process might just work well on Easter eggs! 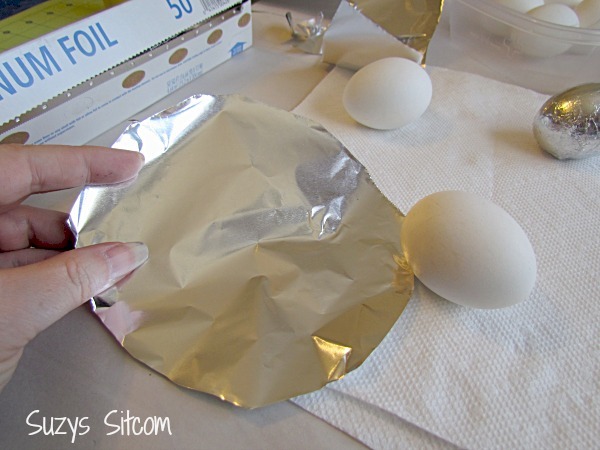 Begin by cutting an oval out of the aluminum foil that is large enough to encompass the egg without too much extra foil. 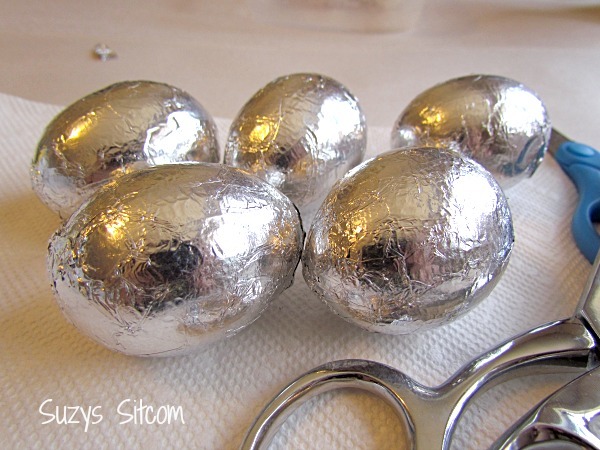 (Use your least favorite scissors for this as foil will dull them pretty quickly). 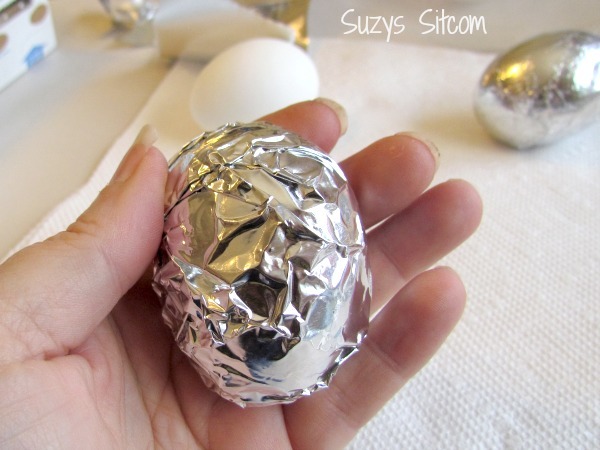 Here is my egg wrapped in foil. Not much to look at yet, but we are going to do some magic here! 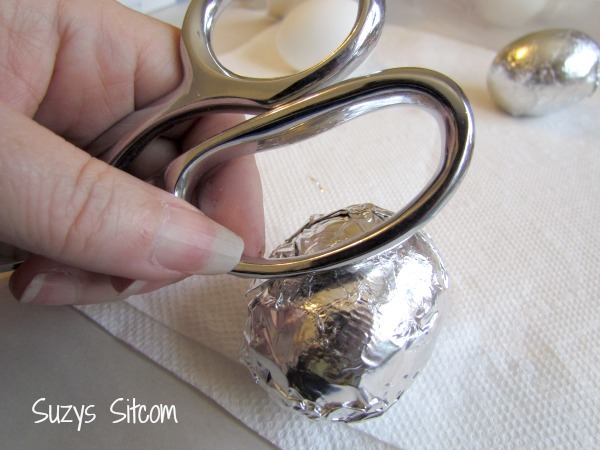 I used the handle of my good scissors to start burnishing the foil onto the egg. For this you can use any hard tool such as the handle of a butter knife, or even the end of a paintbrush. I used my handy-dandy quilting scissors. 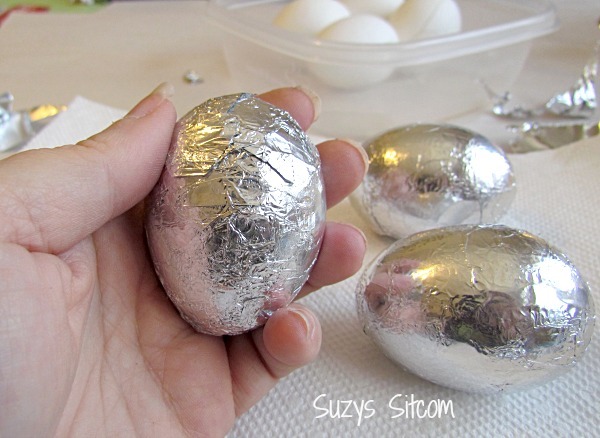 Simply rub the foil with the hard tool until it smooths out onto the egg. 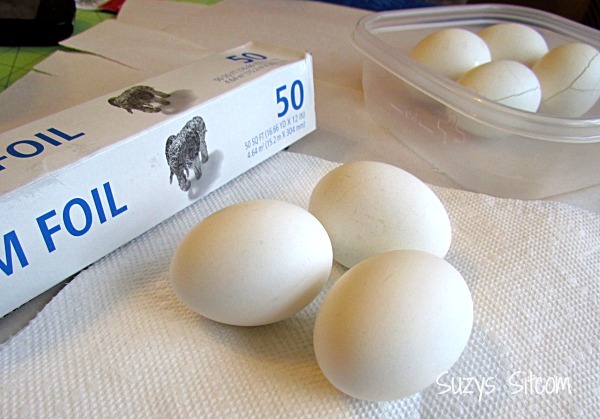 This takes a bit of practice because you will need to push a little, but don’t want to crack the egg. You will notice that the egg has a definite front and back. That is okay, though. Once the acrylic paint is added, it looks beautiful either way. 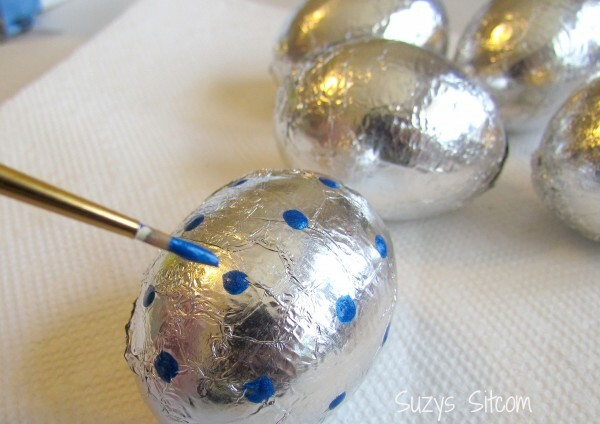 Once all the eggs are covered in foil, you can either stop here, or go to the next step! Why, we are going to paint it of course! Grab some acrylic paints and go for it! 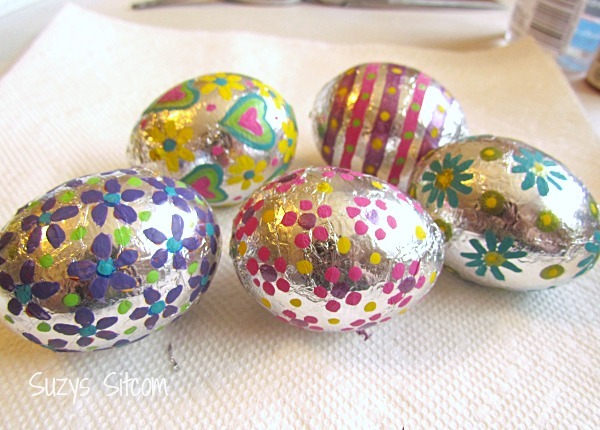 I painted one side of each egg, let it dry and then painted the opposite side. No two eggs are alike and they are all fit for a pretty Easter basket! In fact, I put two of them in the hubby’s lunch box this morning. I would love to see his face when he opens his lunch box in front of the guys. Bet I get a phone call! LOL! Want to try your hand at quilting? My newest quilt Pattern- Batiks Gone Wild! A great gift! Are you new to the Sitcom? Be sure to check out my Frequently Asked Questions Page! For over 150 crafty tutorials for all ages, visit my Tutorial Page! Next post: Do you have a thing about Reality TV too? Previous post: Easy to make DIY Purse Organizer!